Exercise Of The Week : One-Arm Dumbbell Rows! One-arm dumbbell rows emphasize the whole lat, the upper back, and the trap muscles. To learn more about this exercise and its variations continue right here. The first time Anita and I worked out together she said we were going to train the back. My response was... no problem. Well, when we started with one-arm dumbbell rows and she started warming up with a pair of 60's, I knew I was in store for something maybe I wasn't looking forward to. After the 60's came 80's then 100's and then the sets started with her doing 4 sets of 10 reps each with 115's! I just had to use the heaviest dumbbells in the gym and those were only 120's. When doing one-arm dumbbell rows you are working the whole lat, the upper back, and the trap muscles. The back structure is so large and complex, for the best results, it's preferable to train the back through several exercises for more complete development. There are a couple different ways for doing these. I prefer to do them off the floor with both feet on the floor, with a staggered step and one hand on the dumbbell rack. But for the most part a lot of others like to use a weight bench. Place one leg (knee) up on the bench for support, and the other on the floor creating a base. In both positions bend over so your back is parallel with the ground. Now reach down and pick up a dumbbell while keeping your back flat and parallel to the floor. The other arm should be locked out on the bench. Anita Ramsey Getting Set up. Do not keep your head up like some teach or tell you too, this puts pressure on your neck and spine so keep our head in a neutral position almost looking down. After you have a dumbbell in one hand, arm fully extended and palms facing inward. Lift the weight up to your side under control. Lower it slowly under control on the eccentric movement and then repeat using the other arm. On The Left, Then Right. Always start with your bad arm, or weakest side first. Without cheating lift the dumbbell as slowly as you can. Keep your stomach tight, and do not rotate your body especially your hips. Once you've "rowed" lower the dumbbell slowly and repeat. One-arm dumbbell rows personally are one of my favorite back exercises. And for a big thick back you need to use heavy dumbbells. But, if you have a tendency on each rep to get that old lawn mower started then you are not doing this movement right. 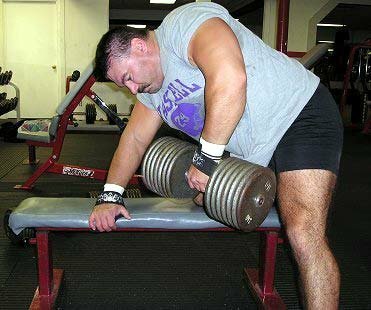 Doing them that way will make you a point of discussion on how not to do things in the gym, and of course they will not increase size or strength if done in that manner. So, are you a lawn mower starter when it comes to dumbbell rows? Remember, to keep your back parallel with the floor resting one arm and a knee on a bench. Grasp the dumbbell with the free arm, raise the dumbbell right up to your side squeezing the lats then lower the dumbbell to the starting position about an inch off the floor. Do 6 to 8 reps for 3 to 4 sets with each arm. Always start with your weaker side or weaker arm. Keep It slow & Controlled. Try doing one-arm dumbbell rows on an incline, either single or lie on the incline bench face down and grab a dumbbell in each hand doing one-arm dumbbell rows like a chest supported row. Here's a great way to implement one-arm dumbbell rows into a back routine. Start with wide-grip chins or pull-downs to the front, t-bar (supported chest) rows, then dumbbell rows, finishing off with either dumbbell or barbell shrugs. The back structure is so complex that for the best result's you should train the back using several different exercises at different angles for complete overall back development. First do wide grip-chins to the front for 3 sets of 10 or 15 reps.
Next try the chest supported wide grip t-bar rows. Go as heavy as you can on these but not so much that you cannot do them on your own. Proper technique comes first. T-bar rows are good for the upper back, upper traps, and rear delts. Slowly increase your weight each set. Do these for 4 sets of 6 repetitions. Now it's single arm dumbbell rows. Do 6 to 8 reps for 3 to 4 sets with each arm. I sometimes work into sets of 3 reps going "super" heavy. Well, super heavy for me of course, and that would be using 160's and 180's, again for reps of 3. Next turn to 3 sets of dumbbell, straight bar or trap bar shrugs with a full range of motion up and down. Click Here For A Printable Log Of This Back Routine. Concentrate on pulling the dumbbell up with your back rather than using your biceps. Do negatives (lowering). This way you can work your back in an overload style. neo pad Using straps on one-arm dumbbell rows. Without straps, most lifters can't hold on to the weight for the whole set. When using straps you can 'feel' the movement working your target muscles because you are not gripping hard enabling you to pull more with your stronger lat muscles then your biceps. Straps will also permit better form, which is critical for best results. More about straps in the bonus section of this article. "Strap It On! Wrap It Up!" You begin your back training with dumbbell rows. Your lats are capable of 6 reps, but you can only hold on for 3 good repetitions. Simple! Just add a pair of lifting straps to the workout. Straps, if used wisely, are the best of all training gear. Basically, lifting straps are made of strong fabric and are sown on one end in a loop that fits around your wrist. The other end extends out for several inches. Some straps also vary in the lengths of the end that is wrapped around the bar. The extended end is wrapped around the bar and held inside your fist. A lifting straps main purpose is to assist in gripping a weight that would otherwise be too heavy to hold during an exercise. Thus eliminating gripping power as the weak link, but also lifting straps eliminate using secondary muscle groups and emphasize the main muscle groups you are attacking. Their most common use is for back work, some of these include pull-downs, rows, chins, deadlifts, and shrugs. But, they can also be beneficial while doing side lateral raises, bent over laterals, dumbbell curls, and certain Olympic movements. Lifting straps are tools of the trade. Using lifting straps and wraps in training can help your physique development and strength gains monumentally. So, get a pair if you don't already have a set right here at Bodybuilding.com. Lifting straps are great tools that every bodybuilder should incorporate in their training. So, strap up and get big! Exercise Of The Week : Seated Cable Rows. Exercise Of The Week: Flat Barbell Bench Press. Exercise Of The Week: Dumbbell Flat Bench Presses.